Hospitals showing dogged determination to capture owed payments are adding up to their woes because consumer watchdogs are up in arms against healthcare service providers that aggressively pursue medical bill collections. It may seem unfair not getting paid for life-saving medical care, but healthcare providers face a tough choice to stay in business especially when stretched between free-of-cost treatments and recouping from mounting debts. Unlike hospitals, physicians attending to health needs are less vulnerable to legal actions. Therefore, physicians must proactively relook the debt collection policy. To deal with a rather sensitive issue such as this, it accentuates the need to rework the strategy right from pre-registration, patient intake process, to involvement of collection agencies to pursue delinquent accounts. Debt collection has always remained a grey area in business because urging someone to pay is a notion that makes many people cringe. But having a steady stream of revenue from insurers and patients is the only way to maintain capacity and avoid crippling failures. How to Deal with Unpaid Patient Bills? The AMA clearly forbids harsher debt collection practices but unequivocally permits a provider to levy interest or reasonable late charges on delinquent accounts. A majority of practices will send late payment notices once in 30 days for a duration of 3 months. In most cases, if patients continue being non-responsive, it implies that prospects of getting paid are slim until other options are considered. 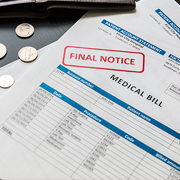 In such circumstances, healthcare providers turn to debt collection services. But making such a move must be contemplated with caution because it can ignite legal issues especially if patients are harassed by agents. Hospitals are formally discouraged from turning over patient details to collection agencies before a licensed physician scrutinizes the accounting and collection policies of the debt collector. A reputed collection agency will not use highly aggressive tactics such as putting a lien on a patient's immovable assets. Partnering with debt collection companies that resort to extreme measures for recovering dues from delinquent accounts can harm the provider's reputation. Before outsourcing the task to debt collection agencies, it is a good practice to review credibility, and productivity rate of the collection agency to understand if they adhere to ethical approach for collecting money from patients. Since physicians are highly sensitive towards their patients they are less likely to turn to harsher methods of payment recovery. However, hospitals take a different approach since they do not maintain emotional closeness with patients. A reputed debt collections company will always show compassion and discretion towards patients who are homeless, terminally ill, or impoverished. How to Create a Medical Bill Collection Policy? Healthcare providers who disregard the fine print of payment collection are most likely to draw strong flak. Most of the hue and cry revolved around "bodily detachment", a controversial practice of issuing arrest warrants against non-paying patients. Most hospitals expressed shock after realizing that such practices are routinely employed by debt collection companies. In the wake of public outcry, most hospitals have already begun revising the contract with debt collection agencies. After seeing multiple discrepancies in the payment collection methods, AHA issued legally binding collection guidelines for healthcare practices. Under the latest guidelines, healthcare providers must choose a debt collection partner after thoroughly evaluating their merits. It also warranted analyzing the financial condition of the patient beforehand. Since hospitals have a higher volume of payments to claim compared to physician groups, the collection strategy may differ. However, hospitals are expected to set an example for other providers because an efficient collaboration between hospitals and physician groups is likely to benefit the medical community as a whole. Instead of looking for ways to circumvent legal concerns attached with pricing, hospitals must negotiate other ways without affecting the long-term sustainability. If a patient cannot foot the medical bill, then physicians are likely to shoulder the financial burden. Unlike hospitals, physicians are less likely to use aggressive debt collection methods fearing litigation, and partly due to inadequate skill in front-office functions. While collection from insurance companies are streamlined, the same cannot be said in the case of individual patients. Physicians who are keen to involve in medical bill collections can sign up for training programs to hone negotiation skills. This duty can also be delegated to front-office staff by imparting training in the collection of upfront payments and insurance co-pay. One of the proven ways to stay on top of medical bill collections is to ensure completion of payment before a patient exits the healthcare facility. In doing so, you can eliminate negligence towards the bill statements, which some individuals are likely to feel if payments are due. Additionally, the risk can be lessened by training front-office staff in data entry to gather and document correct contact information such as social security number, phone number, insurance information, residential address, etc. This information will come handy to track delinquent patients with uncleared bills. It is possible to learn a great deal of information about a patient's paying capacity through first-hand interaction, but it is the training received by your staff that counts. By considering the patient's financial information, it is possible to recommend a viable payment plan. If patients are aware of the payment options in advance, it would enable them to avoid falling behind on payments - which is good for both medical providers and patients. With rules becoming tighter, it can be increasingly difficult to stay on top of due payments and provide quality care at the same time. It may be irresistible to involve debt collection agencies to recoup losses accumulated due to non-payment for the healthcare service. However, it is not an easy choice to consider especially when a majority of them follow controversial collection practice that falls outside the AHA guidelines. Sensibly choosing a debt collection agency by investigating their past performance can cut down the risk of legal liabilities. So are you ready to explore ways to improve medical bill collections? If you are pondering how to deal with unpaid patient bills without resistance, the cost-effective option is to look for a professional collection services provider. If your choice isn't Outsource2india, you could be risking litigation and defamation from agonized patients due to non-compliance with AHA guidelines. But being a true professional in medical bill collections for the past 20 years we have earned stripes by recovering dues without damaging relationships with patients. With awareness of the AHA rules, we compassionately urge delinquent patients to complete the pending payment by presenting feasible payment plans. Our courteous and skilled approach in the service execution has earned us merits and ISO 9001:2015 certification. We also offer other healthcare BPO services such as medical billing and coding, claims adjudication, medical transcription, and more. Get in touch with us to know how we can help you get back the money owed as part of healthcare service.